I fished the Smashbox Soft Focus Powder Eyeliner in Gunmetal out of a press day goody bag a couple of months ago and promptly fell in love. Deeply pigmented with a lovely hint of sparkle, it ticked many of the boxes that the Guerlain powder liners have never been able to do for me — number one being a soft, flexible tip that doesn’t fill me with fear everytime it comes within 2 inches of my eyeball. I think that these powder eyeliners are a love ’em/hate ’em type affair and after buying and giving up on the Guerlain Kohl, I thought I was in the latter camp along with all the other haterz. Yes, there’s fall out. Obviously more so than any other kind of liner but I remedy this by applying before foundation and it doesn’t bother me. You can (if you’re careful), apply without dropping a speck but if you manage it consistently, you’re a better woman than I am. 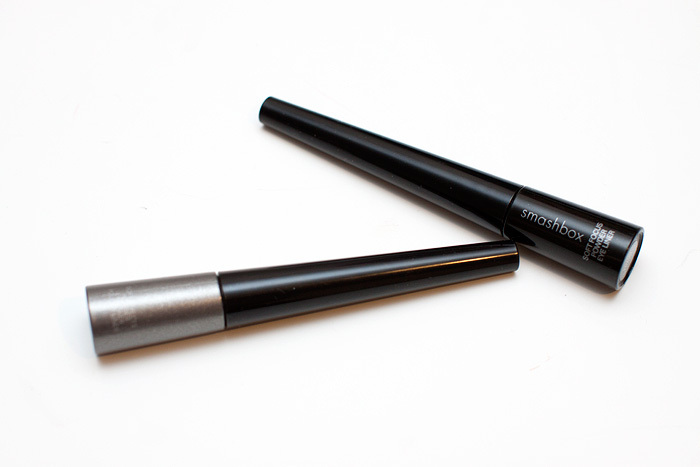 The ‘nib’ of the wand is a flexible, soft sponge that holds enough rigidity to run along the waterline but is also soft enough to provide a good application to the lashline. I feel that the Smashbox shades are inferior to Guerlain’s which are generally, simply beautiful — but I can work with these happily. The Gunmetal on the left contains more sparkle than the Black. The fall out is visible and I didn’t take any care here to minimise it. I went out and bought the Black because I loved the smoky definition that the Gunmetal provided but wanted something a little more dramatic to wear in the evenings. 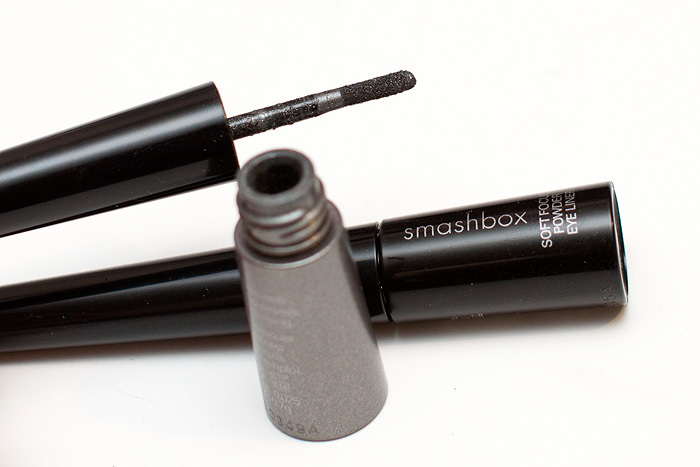 My favourite thing about the Smashbox Soft Focus Powder Eyeliner is the way they wear after a few hours, the line fades evenly and cleanly – if you want something sharply defined that will look the same at 6pm as it did at 8am, these won’t be for you. Over the course of the day, they soften and melt without straying too far and give a nicely ‘lived in’ look, not as dramatic as the whole rock-chick thing but heading in that direction. The Smashbox Soft Focus Powder Eyeliners are priced at £19.50 each (yes, expensive) and are available instore at Debenhams, or you could save a few pennies and buy online from JustBeautyDirect. 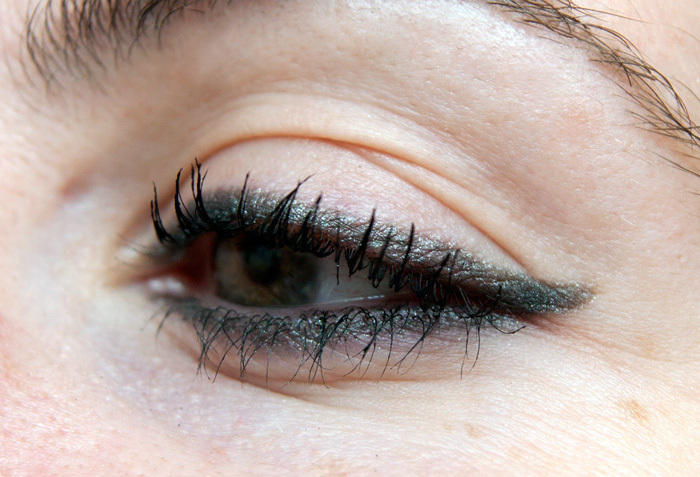 Do you wear loose powder eyeliner? Love it or Hate it? I know this is a random comment but you I was wowed by how curly your lower lashes are. Damn my feeble disappointments for eyelashes! This looks lovely on you and I think gunmetal is a great colour. I just wish I was as sensible as you and remembered to apply my foundation afterwards! 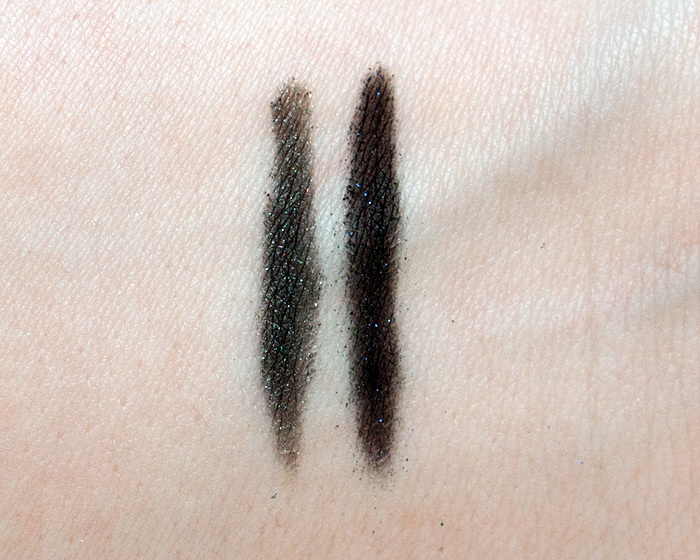 I’ve got one powder liner, and I find myself too clumsy to use it without a lot of fallout! Looks lovely on you, though. That looks lovely but very expensive! Ouch! Looks really pretty! And I agree you have amazing lashes! I am lemming! I want one of these so much, they look beautiful! How apply this beautifully! I can ever get enough control to do apply these. Rock ooon! Opps, I meant, “How beautifully YOU apply this.” My brain has yet to wake up this morning. It looks beautiful on you! And your lashes look amazing too! The gunmetal one is absolutely to die for. Love it! I really like sparkly grey colours.